Trouble free designs for popular styles: Cambria Praa Sands Dark Cabinets Backsplash Ideas. If you are in love with, traditional, contemporary and transitional styles in your kitchen design;Cambria Praa Sands Dark Cabinets Backsplash Ideas is yours. The chance of using soft earth tones backsplash will increase the beauty your kitchen. 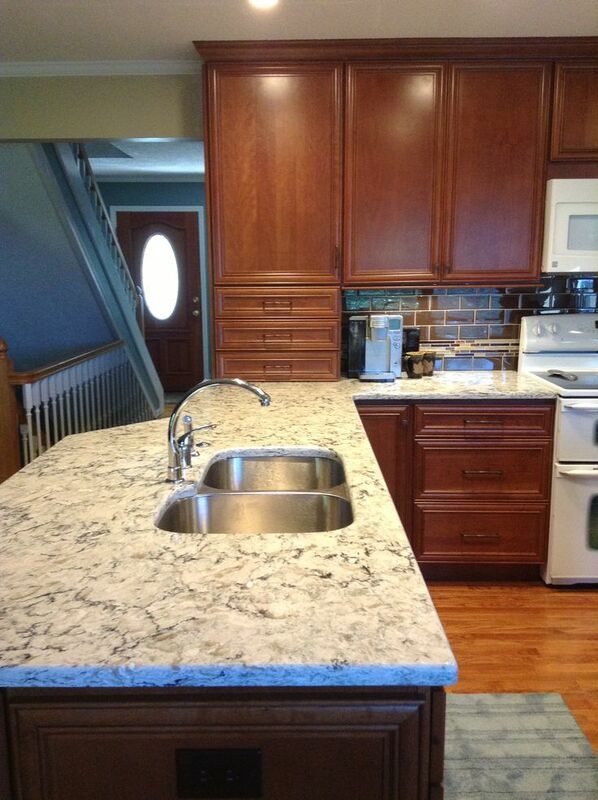 Cambria Praa Sands Dark Cabinets Backsplash ideas are a pretty good remedy for your backsplash selection. The backsplash colors can be pastel tones like creams, soft browns, or off whites in Cambria Praa Sands Dark Cabinets Backsplash Ideas. The material can be picked as ceramic, glass, limestone or travertine. The shape of backsplash can be subway and mini subway and matchstick. The full high backsplash is fancy too. Please kindly check my Conch Shell Sound: Cambria Praa Sands Countertop article. I am sharing my faves with you about Cambria Praa Sands Dark Cabinets Backsplash Ideas in Pictures. I am wishing you a nice visional show while you are looking at them. Picture Credit: Luxe Showrooms., Amazing combination of textured glass subway tiles and mini subway porcelain tiles. Both tiles are strongly bonded to Cambria Praa Sands Countertop. 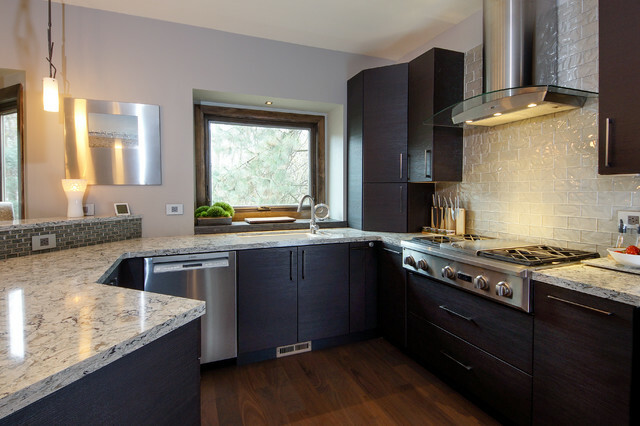 The dark oak Melinga frameless textured foil cabinets emphasize the contemporary kitchen design . The foil was wrapped on the doors horizontally giving it a more modern look.The pendant light is a wonderful hand-forged iron pieces from Hubbardton Forge, a Vermont Lighting company. A textured glass tile was used behind the hood which reflects the light in the room (especially when the hood lights are switched on). Hats off design. Please stay tuned, I spy with my eyes the name of the wall paint and flooring details. Picture Credit: Millbrook Custom Kitchen via Houzz., Limestone subway tile , glass matchstick borders and Cambria Praa Sand Engineered Stone Countertop. Transitional kitchen design in U-shaped kitchen. Autumn stain cherry cabinets and red oak flooring collaborate perfectly opposed of Cambria Praa Sands’s blue swirls. Picture Credit: Kitchen Sales Gallery and Denise Honaker Designs., Cherry Cabinets with Cinnamon w/ Cocoa finish and brown high gloss finish ceramic subway tiles are the main inspriation for me. They seem to me the rocks on the coast and Cambria Praa Sands Counterop lies on them as sea foam. Red oak flooring is one of my favorite with dark cabinet ideas. The designer has a bold taste in traditional kitchen design. Picture Credit: The Shower Shop., Cappuccino finished maple cabinets,Cambria Praa Sands and dark glass matchstick backsplash define well with travertine flooring .Stainless steel appliances bring extra shine to this kitchen. Doable and effective design. Please speak your mind and help to have more valuable article in Cambria Praa Sands Dark Cabinets Backsplash Ideas. Thank you for reading.